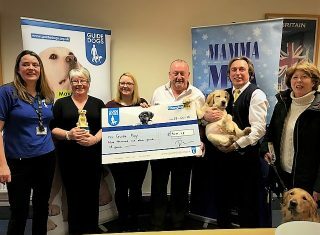 Greatdays is proud to announce that fundraising efforts throughout 2017 have raised an incredible £9,000 for our chosen charity Guide Dogs for the Blind. The money was raised through raffles at each of our popular Greatdays’ Day Trip events which included the Cruise the World entertainment lunches and our smash hit “Mamma Mia Christmas Show Party” which was attended by 5,500 guests across the country. A heartfelt “Thank You” to everyone who participated. We are all particularly excited about the fact we exceeded the fundraising target, so we have the privilege of naming our very own Guide Dog puppy! To celebrate, Diane from Guide Dogs brought Charlie, a 4 month old Golden Labrador guide dog trainee with Peter his trainer and Chelsea, a working guide dog with her owner to meet all the staff at the office. Having the dogs in the office was a delightful distraction, thank you so much to Diane, Peter and Mary for making the time to visit. We look forward to posting our “pupdates” as soon as our puppy has been born and named. Warning: there may be a cuteness overload!